At the end of a Gardening Year 2010, you’re just brimming over with thoughts and ideas about what worked and what didn’t and what you’re going to do the same—or differently—in Gardening Year 2011. Perhaps you even have a scattered collection of scraps of paper with scribbled notes on them. But when Gardening Year 2011 begins, how many of those great ideas will you remember—or be able to decipher? 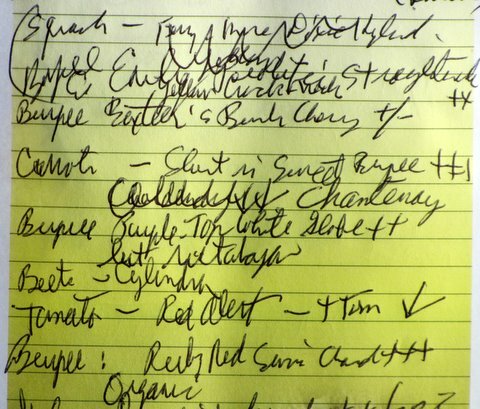 How many will you recall if you haven’t even jotted them down in your personal shorthand? Now that Thanksgiving is past and the weather is turning colder, it’s time draft your gardening notes. For five years I kept a garden diary in a bound book, but I wrote in cursive and then had the problem of trying to find particular entries and then deciphering my often abbreviated squiggles. So a few years ago I started a garden diary file on my computer. Each year I start out trying to write notes on a daily … then weekly … then monthly … then … you get the idea. So at the end of the season I force myself to take my haphazard notes, add my current thoughts, and update my computerized garden notes for the year. I like computer notes for two reasons: (1.) I type faster than I can write and then can read what I typed, provided, of course, I have my fingers on the right keys, and (2) later I can usually find what I’m looking for quickly by using the “Find” function. 1. Overwinter research recommendations for control of the plague of brown marmorated stink bugs, which took a heavy toll on my tomatoes, raspberries, blackberries, and green beans. 2. Don’t repeat the four new lettuces I tried this year, but go back to my long-time favorites, Paris Island Cos and Red Sails. 3. Repeat Burpee’s Short n’ Sweet Carrots, which grew impressively, and sweetly, in our piedmont Maryland clay. 4. Dumb-dumber-dumbest: Remember to order rutabaga seeds, not purple-top turnips. 5. Reduce tomato varieties from 8 to 4 or 5: Sungold, Juliet, Yellow Plum, Celebrity, and another “big red.” Reduce number of plants to 20 max. Those tomatoes aren’t getting any younger. 6. Repeat growing squash around a 4-gallon “drip irrigation” bucket with holes drilled in the bottom. Plant green zucchini and yellow crookneck again in late June to avoid squash vine borers. At the beginning of Gardening Year 2010, I looked around the garden and tried to remember where I had planted tomatoes in 2009 so I could rotate my tomato crop to a different part of my garden. Thorough garden cleanup, three blizzards, and six months had left no tell-tale evidence in either my garden or my memory. I went into the house and searched my computer notes—and found nothing. Learn from my experience. Write your 2010 garden notes now—which is what I did last night.